The premises which the new store will move into. An abandoned cafe is to be transformed into a new shop in a further boost for Elgin’s town centre. Trespass, the outdoor clothing company, will open on August 7 in the former premises of Cafe Ecosse which closed in February last year. And it will give a double boost to the town, with a number of jobs expected to be created by the store opening. Local councillor John Divers hailed the news as another step in the right direction for the town. He said: “It’s one of a number of shops that we are aware of in the last few months that are being filled up. “There are a number of other shops that have opened up, showing that businesses are prepared to come back to Elgin – and hopefully it will continue. 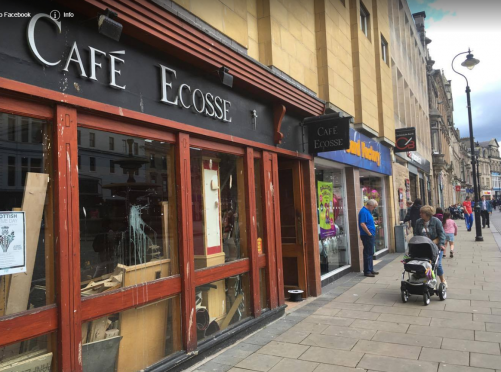 The owner of Cafe Ecosse blamed its closure on a drop in the number of shoppers in the town centre and high overheads. But Trespass are confident things are on the up for the town.